You know how every house has one room that is just out of control? This room has given me trouble from the day we bought this house. When we moved in, this was the only room that had a problem (the ceiling fan/light wouldn’t work). And since then, I haven’t been able to do a thing with it. We like to call it an office, but let’s be honest with ourselves, it’s become a junk room. Just your standard junk room office closet – craft supplies, vacuum, clothes that Noah doesn’t wear very often, and gift wrapping (you can’t see it in this picture). Noah’s college diploma is beside the desk- mine will eventually be under it, if Alabama ever decides to send it! This was Noah’s mom’s desk when she was a little girl. It is now FULL of supplies and books! I mentioned in an earlier Show Us Where You Live that I had been able to contain Noah’s Alabama collection to the guest room and the office. Well, here’s the office part of it! The first picture is one I gave Noah for one of our first anniversaries. We were headed out to eat in downtown Tuscaloosa one night, and he saw this in the window of a consignment shop and loved it. I went back and got it the next day for him, and it’s been hanging somewhere in his house ever since. The second picture is of Gene Stallings and Bear Bryant. It’s actually a really cool picture – it was taken right after Gene (who played under Bear at Texas A&M) beat Bear in the Cotton Bowl. Gene was coaching at A&M at the time (he went on to be one of our best coaches), and of course, Bear was coaching Alabama. Bear Bryant went up to him in the middle of the field after the game and gave him a big hug, lifting him off the ground. 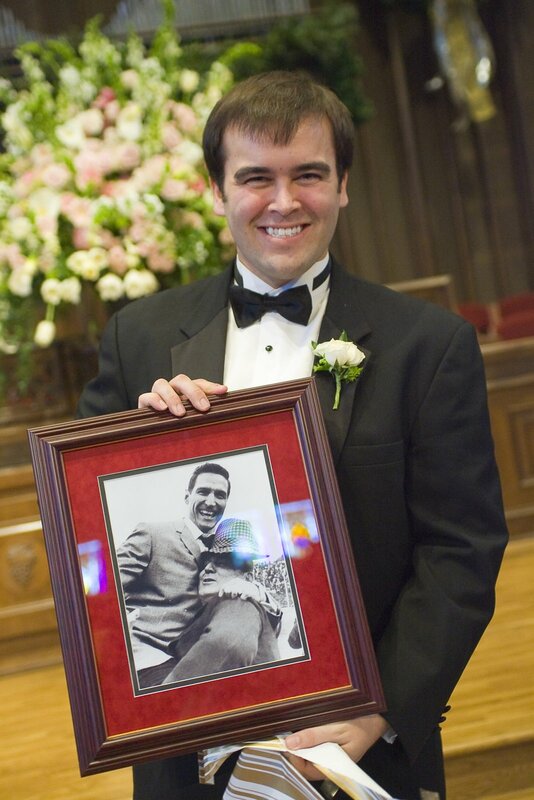 That picture is Noah’s favorite picture ever taken of anything relating to Alabama. It was his wedding present from me…I knew I wanted to give it to him, and could not find it ANYWHERE. I had to call around and find it for him. He was pretty excited when he got it. We even have an Alabama night light in here. Courtesy of Wal-Mart in Tuscaloosa, of all places. Something tells me the Wal-Marts in Auburn and Knoxville, TN don’t have these though. Ok, back to the office. This might not mean much to you, but the contents of this bookshelf in the office hold 2 years worth of VERY hard work for me. This is every folder I had in the Education Program at Alabama. I’ll save these forever because I worked my backend off for them, and they have a lot of good things I can use in my classroom! We eventually want a futon or small bed in that big blank area. Looking out the window – pretty much the same view as the guest bedroom, but somebody actually came the other day and cut that monster of a field! Hopefully that will eliminate the spider/fly population in my house (currently at about A MILLION). This used to be the entertainment center at our condo, but is now a printer/stationery holder. It will (hopefully) one day hold a TV, when we get that futon. Noah’s koozie collection – it’s getting a little out of control. This is only 1/2 of what he has! And there you have it…the most jumbled, hodge podge of mess in my house. Hope you enjoyed it…haha! Wanna show off your office or get ideas for one (like I need to be doing)? Head over to Kelly’s Korner for details! ROLL TIDE!!!!!!!!!! !My husband is a HUGE Alabama fan too! We have a HUGE Alabama art print that is currently sitting against the wall at our house in the guest room… I guess I will have to let him hang it somewhere soon… I guess when we move back to our house he can choose a place for it! Thanks for sharing your home with us! I was a teacher so I appreciate those binders filled with teaching classes. Still have mine too.By the way- Geaux Tigers! Cute room! I love seeing lots of SEC fans! You have a ton of space to work with!! Thanks for sharing! Love the paint color! Oh the possibilities are endless aren't they? The room is big too! 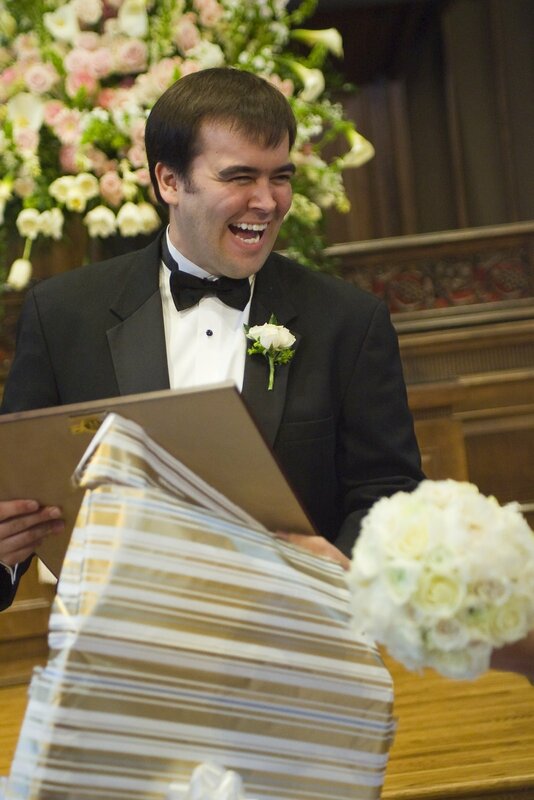 Truly ADORE the expression on your hubby's face as he see's his precious wedding gift from you! PRICELESS! ROLL TIDE!!! LOVE those Alabama pictures! We live in Tuscaloosa too and I have only let my husband hang one Daniel Moore print in our house. I told him he could bring out the rest of his BAMA stuff when we have a house big enough for a Man room:). Just saw where you are going to be a 1st grade teacher! That's awesome! My oldest will be attending 1st grade next year! Where will you be teaching? My office is also a sort of junk room. I call it our Monica room, from Friends!I am a teacher, too, and am moving to first grade for next year. So exciting! You have a great office. It looks very neat and organized. Mine is a mess so I didn't post it. I am an SEC fan too, but I like those Hogs! Love the pictures of you giving your husband his gift. What fun memories every time you see that print! I just found your blog and I really enjoyed reading this post. I live in Knoxville and no, we don't have those night lights! haha! Love all of your Alabama stuff! We're in Gadsden and we're HUGE AL fans too. ROLL TIDE!!!!!! Thanks for sharing! My husband is a huge Alabama fan too! This room is too clean and neat to be called a junk room!! It is a huge room!! I love your blog!! I totally understand your frustration with the "one room" that is the bain of your existance. 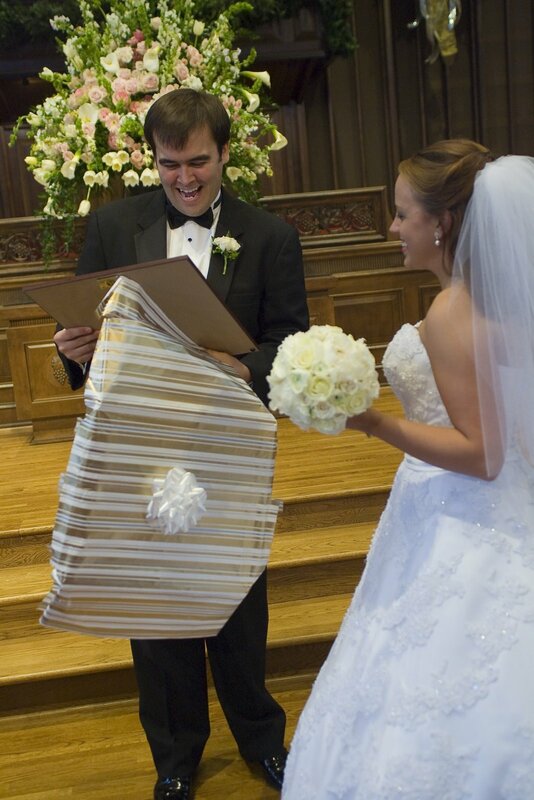 I love it though, and what a great idea for a wedding gift!! Your office makes mine look like a tornado hit! 🙂 No, seriously, I decided not to post it…maybe it was my pride! lol! Anyway, I like all the Alabama stuff! It looks great for being a "junk room!" GO VOLS!nope, sorry.knoxville is ALL VOL COUNTRY! he he he!just kidding! have a blessed night! Great room! It has soo much potential. Every room can't be perfect, because there would be no projects to do!